Do you know how to pick out the best pineapple? Do you sqeeze, sniff or do all of the above? COLOR When picking out pineapples, the first thing to look for is color. Some people pick out a green pineapple thinking it will ripen when they get home. However, it’s best to get a pineapple that is mostly bright yellow. It can have a little green but should be a nice golden yellow overall. LEAVES You may know the old trick about checking the leaves of a pineapple… but what exactly are you looking for? 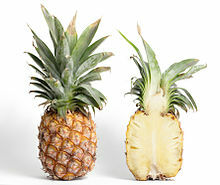 You should actually tug at the leaves of a pineapple to best determine ripeness. If the leaf pulls out easily, then the pineapple is too ripe. If, on the other hand, the leaf is very difficult to remove, it might not be ripe at all. Aim for something in the middle! SQUEEZE After administering the leaf test, make sure to give the pineapple a good squeeze. Make sure it has a little give to it. Try to check this before cutting the pineapple open at home, otherwise, you may waste a fruit that isn’t ready to eat yet! SNIFF The absolute best way to select the perfect pineapple is to sniff the bottom. That’s right! You should smell a sweet, pineapple scent. If you can’t smell any sweetness, put it back!